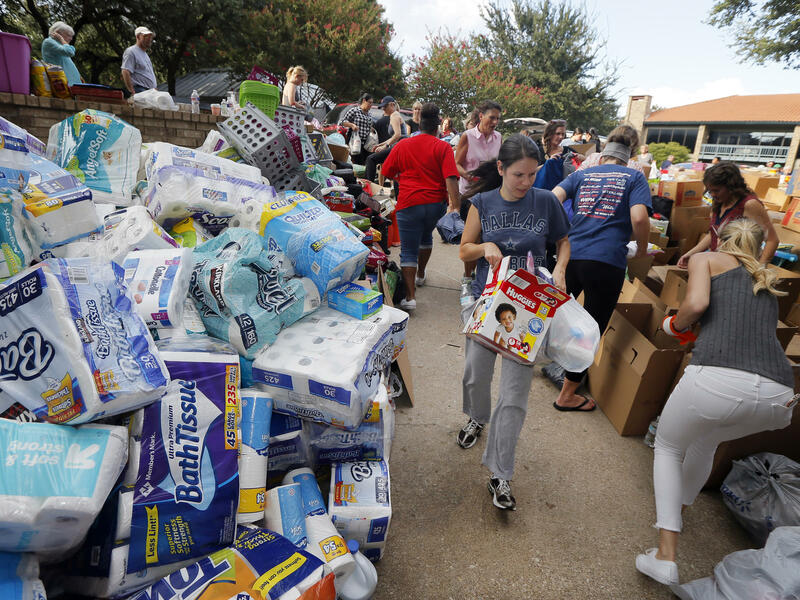 Volunteers organize stacks of donations that were dropped off Tuesday at the North Dallas location for Hurricane Harvey victims. Hurricane Harvey is a devastating reminder of how helpless we are when facing nature's human-dwarfing powers. We dig holes and barricades, build dams and create ingenious systems of canals and levees. We try to pull the brakes on natural forces, or at least tame them. These measures protect us, and we surely would be worse off without them. We have come a long way since our cave dwellings. But then comes the storm, the tornado, the tidal wave, the earthquake, the volcanic eruption and, despite all our amazing engineering and technology, we are like the ants under the trampling foot of a 3-year old. There is a hierarchy in the natural order — and to fool ourselves into thinking we are above it is a grave mistake. Humans are the product of very detailed circumstances that combine the randomness of genetic mutations and the changing environment in which we evolved. After millions of years, our hominid ancestors became us, not much longer than 200,000 years ago, the blink of an eye in Earth's 4.5-billion-year history. The way our senses work, the way we move, everything in our bodies is finely tuned to thrive on this planet under conditions that, despite fluctuating temperatures, haven't changed much. Anyone who has hiked up a 12,000-foot peak knows how hard it becomes to breathe as we go up. Temperature swings get to us quickly, and both heat waves and cold fronts can be deadly. We have no fur, no huge reserves of fat, no horns, no sharp teeth, no poisonous bite or an exoskeleton to protect us. Our differentials are an opposable thumb, sweat glands and a large frontal cortex. Thanks to those, we were able to transform the planet — or at least some of its surface and atmosphere. Unfortunately, our partial successes have blinded us, creating an illusion of control and mastery over the planet we inhabit. Yet when a natural disaster comes, we are sent back to our primal conditions: no shelter, no electricity or heat, food shortages, no clean water. Never at rest, germs take advantage of our temporary weakness and diseases spread, often faster than we can fight them. In situations like this, all we can do is rely on one another to rebuild and regroup, trying to use what resources we have to re-establish a sense of community. As we have seen before, there will always be those who take advantage of the situation to benefit themselves. But it is also in such dire conditions, when we hit rock bottom, that what is best in us surfaces and individuals become heroes, putting their lives at risk for others, strangers or not. This is how nature teaches us about our humanity, when the survival of the group surpasses the survival of the individual. As global warming proceeds to change the planet, we will experience many severe weather events that will push to its limit our ability to adapt to different environmental conditions. How well we will fare will depend, to a large extent, on how well we will preserve our sense of community, our best human qualities, despite the cultural differences and tribal allegiances that split us apart. The tests will be harsh, and our balance is already quite precarious. Hopefully, when crisis after crisis hits with increasing severity, we will see more heroes than foes ruling the day.